It’s not hard to find. All you have to do is turn on the TV and comment on how stupid their image of educators are. Myth #1: High school English teachers sit around all day reading and discussing great literature, and crafting Romeo and Juliet lesson plans. Truth #1: High school English teachers sit around all day reading Sarah, Felipe, and Nick’s crappy essays. English teachers have no time to read, except in the summer. In fact, if you love reading, become a Math teacher. Myth #2: Students hate to read. Let them choose the book. Let them think they chose the book. There have been literally (yes, I meant that pun) millions of books written, which means there’s at least one for even the most resistant reader. Help him or her find it. Myth #3: English teachers can’t do Math. Myth #4: Some students just can’t learn. Truth #4: Some teachers just can’t teach. Teachers are quick to blame everybody (and with good reason, at times) except themselves. Teachers who enter the classroom with the philosophy that there’s no such thing as a learning problem, just a teaching problem, will find a way to get through. Myth #5: English teachers sit around and write all day. Truth #5: Like we have time to write? Myth #6:Grammar is painful to teach. Truth #6: Grammar is only kind of painful to teach. An English teacher who can make grammar interesting deserves a raise. Myth #7: All English teachers are flaming liberals that promote insurrection. Truth#7: Some are flaming liberals that promote insurrection. Some are conservatives who promote law and order. Most are just too darn busy grading essays and conducting notebook checks to do either. 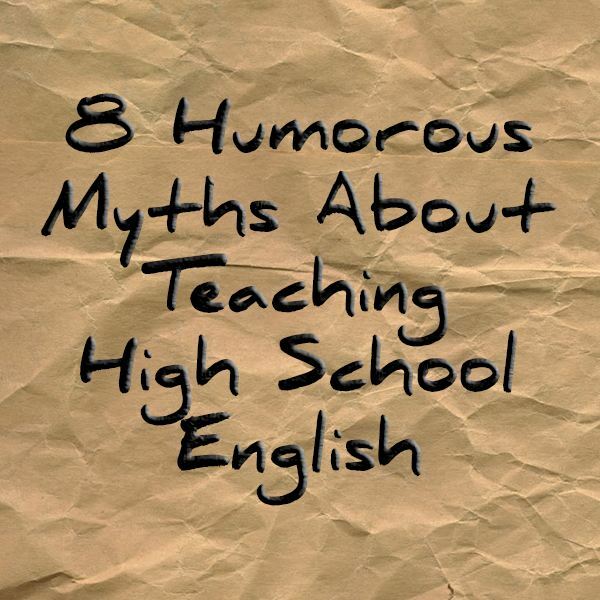 Myth #8: English teachers spend their summers at home breaking down sentences and analyzing literature. Truth #8: English teachers spend their summers in the Caribbean and on golf courses breaking down sentences and analyzing literature.